BJP president Rajnath Singh has called for a debate on why Article 370 of the Constitution should not be abrogated. One wishes he had sought this enlightenment before including the provocative item of abrogation of Article 370 in the BJP election manifesto. Apart from the legal angle, Togadia's hate speech against Muslims and a politically dishonest attempt by BJP and RSS leaders to paper it over should be a justification enough for the retention of Article 370 for the Muslim majority state of J & K.
On August 15, 1947, when India became independent, J&K was not a part of its territory. It was only by the Instrument of Accession, dated 27.10.47, signed by the Maharaja of J&K that the state acceded to the Dominion of India. By clause 3 the Maharaja accepted that the matters specified in the schedule are the matters with respect to which the dominion legislature may make laws for the state of J & K. The instrument further provided that the terms of instrument shall not be varied by an amendment to the Act or the Indian Independence Act, unless such amendment was accepted by the Maharaja. The instrument also clearly laid down that nothing in the instrument shall be deemed to commit the state in any way to the acceptance of any future Constitution of India. This instrument accepted only a limited number of matters -- Defence, External Affairs, Communications -- with respect to which the Indian legislature could make laws for J&K. This special relationship of J&K found its reflection in Article 370 of the Indian Constitution which laid down that notwithstanding anything in the Constitution, the powers of Parliament to make laws for the state shall be limited to those matters in the Union List and the Concurrent List, which, in consultation with the government of the state, are declared by the President to correspond to matters specified in the Instrument of Accession, and such other matters in the said lists with the concurrence of the state the President may by order specify. Thus by virtue of Article 370 Parliament can legislate for J&K on matters other than those mentioned in the instrument but only after obtaining the concurrence of the state of J&K (emphasis supplied). Thus J&K has special status, unlike the other states in India where Parliament can legislate on its own on subjects mentioned in the Union and concurrent lists. It is no doubt true that Article 370(3) provides that the President may by notification declare that this article shall cease to be operative, but the proviso clearly lays down a limitation that the recommendation of the Constituent Assembly of the state shall be necessary before the President issues such a notification. It is not disputed that the Constituent Assembly of J&K has never given any such recommendation. 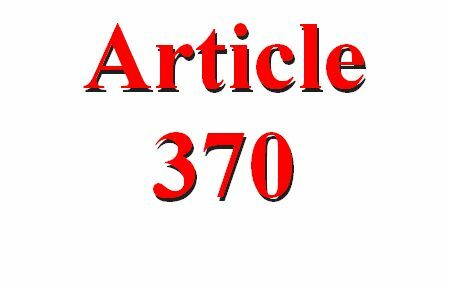 In that view Article 370 cannot be withdrawn by Parliament purporting to exercise the power of amendment given by Article 368. That the power to amend the Constitution is not totally unfettered admits of no disputes vide the famous case of Keshvanand Bharthi, (1973) in which the Supreme Court held that a "Constitution like ours contains certain features which are so essential that they cannot be changed or destroyed". There is also nothing very special in laying this limitation in Article 370. Even Article 368 limits the power of Parliament to make any amendment to the Constitution which would result in a change in any of the lists in the Seventh Schedule; such amendment shall also require to be ratified by the legislatures of not less than half of the states. Under our Constitution the Governors are only formal heads of state and have no powers at all in the administration of the state which is vested in the Cabinet. But yet by the Constitution Amendment Act 1956, Article 371 provides for a special responsibility of the Governor for the establishment of separate development boards for Saurashtra and Kutch (in Gujarat) and Vidharba in Maharashtra for an equitable allocation of funds for the development of the area. No objection by the BJP has been raised which curtails the power of Gujarat Chief Minister Modi, while there is not such limitation on the chief ministers in other states. Article 371G, introduced by the 55th Constitution Amendment Act 1986, provides that no Act of Parliament in respect of the ownership and transfer of land shall apply to the state of Mizoram unless the legislative assembly of Mizoram by a resolution so decides. This provision is identical to Article 370 of the Constitution regarding J & K. The BJP was a party to the above amendment. Why does the BJP apply double standards in the case of the Muslim majority state of J & K?. Even in the USA such is the width of state autonomy that an advocate getting his law degree from Washington University cannot as a matter of right practice in the state of New York. No one has suggested that this is endangering the unity of the USA. Recently in the election fever even the Congress seems to have got entrapped when it gave an election promise to separate Ladakh from the territory of J&K and even give it a separate legislative assembly. This is the most provocative suggestion, which can only inflame the sentiments of people of J&K against India, apart from the fact that it is not legally possible because the J&K legislature will never give its consent, as provided by Article 370. It needs to be appreciated that the retention of Article 370 is a matter of self-respect and honour and an assertion of their distinct identity for the people of J&K. Can't the BJP leaders, even when most of the parties in J&K are desirous of finding a lasting solution, be statesmen enough to give up their opposition to Article 370, which no Kashmiri can possibly agree to abrogate because it is a matter of preserving his special identity? Faced with this reality, politicians must realise that all talk of abrogation of Article 370 is moonshine and a non-issue. It is also a very sensitive matter touching the credibility of our secular professions and the justifiable fears of the minorities. With all this, when it is also patent that the abrogation of Article 370 is not legally and constitutionally possible, is there any moral, political or logical justification to keep up this empty noise? I submit there is none.